In our efforts to always uplift our fraternity’s aim of scholarship, The Joyce-Gillespie-Harrington (JGH) Educational and Charitable Foundation of the Zeta Upsilon Lambda Chapter of Alpha Phi Alpha participated in the 4th annual a Historically Black Colleges and Universities (HBCU) Fair in Loudoun County on Thursday, October 25, 2018 at Tuscarora High School in Leesburg, Virginia. 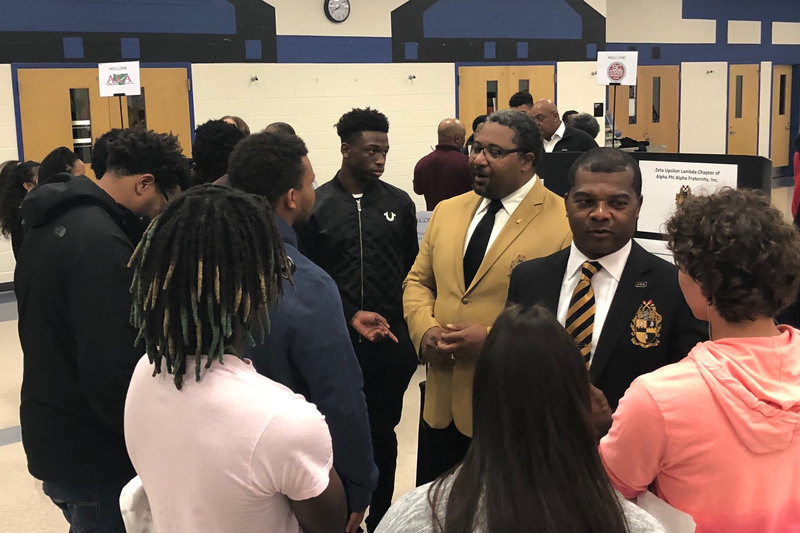 The event, which featured our Alpha brother, Dr. Makola Abdullah, President of Virginia State University as the keynote speaker, connected area students with HBCUs and enlightened them about educational opportunities, resources, and the college experience at these institutions. We joined HBCUs from Delaware to Florida, college and career preparation organizations and other black Greek letter organizations to discuss our JGH Jewel scholarship opportunity and process with college bound high school seniors and our foundation’s programs with interested students and parents. Applications for the JGH 2019 Jewel Scholarship awards will be accepted from December 1, 2018 through March 2, 2019. Application requirements also are available on the website. For more information about JGH please visit our scholarship page or contact Rory Miott at education@jghfdn.org. The Joyce-Gillespie-Harrington Educational & Charitable Foundation is committed to our community's future - our youth. Join Us, Donate Today. Team up with the Joyce-Gillespie-Harrington Educational & Charitable Foundation, Inc. to support our educational and charitable programs in the Greater Metropolitan Washington D.C. area and more specifically northern Virginia. Together, we can move mountains by impacting the educational enrichment of youth and by strengthening the charitable needs of our community.